The Russian banking sector is slowly recovering from the serious blow it suffered in 2015-2016, when the economy swung into a recession triggered by low oil prices and Western sanctions in response to Russia’s annexation of the Crimean peninsula in 2014. The financial sanctions prevent many Russian banks and companies from borrowing money in foreign markets, negatively affecting their performance. As the Russian economy returned to growth in 2017, so did demand for credit providing a boost to the banking sector. Credit institutions’ assets grew by 6.4% in 2017, erasing a 3.5% drop in 2016. The aggregate loan portfolio of banks expanded by 5.7% in 2017, following a 2.7% decline in the previous year. Lenders also witnessed improved profitability ratios and the sector remained well capitalised. 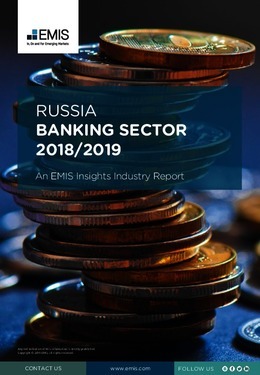 This report provides a complete and detailed analysis of the banking sector for Russia. EMIS Insights presents in-depth business intelligence in a standard format across countries and regions, providing a balanced mix between analysis and data. View key data on assets, liquidity and profitability in the sector in Russia.